Here's a peek at one of the items you'll create in my Spring Flowers Class. I created a flip lid style box to hold some note cards (templates included with class fee)- perfect for Mother's Day gift giving. 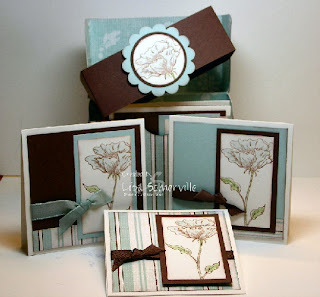 You'll also be creating a few other projects using the Afternoon Tea Designer Series Paper that's included in the class fee. Can't attend class - no problem, pre-order your kit today! Items will be pre-stamped and colored, should you not have the stamps/ink used in class. Email me today for more information. This set is so pretty. You have done a really nice job. another beautiful set of cards!